Marinated prime lean beef air dried in a smoker and sliced with a strong smokey taste. Also available in 35g, 190g and 1kg bags. 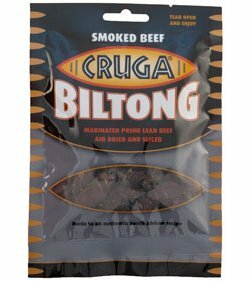 Beef 200g per 100g of Biltong, Spirit Vinegar, Spices, Hydrolised Soy Protein, Salt, Yeast Extract, Caster Sugar, Potassium Sorbate, Citric Acid, Smoke Powder (Maltodextrin, Smoke Flavour), Colour (E150c).